Trec Glucosamine Sport Complex is a dietary supplement containing three active substances with a documented, beneficial effect on the functioning of joints. The product contains glucosamine, enriched with hyaluronic acid and collagen. The combination of these three ingredients helps to maintain homeostasis of joints and can bring a relief to people exposed to the frequent overload. The articular cartilage is a delicate structure, at the same time characterized by high strength and resilience, thanks to which it can absorb shock and loads on which, in particular, active people are exposed. Repetitive movement, high activity, heavy weights, injuries are one of the factors that are an inseparable element of hard training. In addition to athletes, office staff (staying in the same position for a long time), older people (cartilage disorders related to age) and people with an excessive body mass are also exposed to the dysfunction of this tissue. Damage to the joints can cause persistent pain, swelling and movement restrictions, which can consequently contribute to a significant deterioration of the quality of life. It is therefore important to properly protect the joint cartilage. Glucosamine is a natural substance found in the human body and crustaceans. The presence of glucosamine has been noted in most tissues, however, it is most localized in the joints and cartilage. This substance can inhibit the collagen degradation rate and also to a certain extent, delay the progression and reduce the pain associated with degenerative disease, occurring especially in the knee joint. It is recognized that the use of glucosamine sulphate is one of the best ways to deliver this substance through supplementation - this form is highly bioavailable and perfectly absorbed from the gastrointestinal tract. Type II collagen (CII) is a peptide and a component of articular cartilage. In supplementation, it is most often used as a part of pain therapy for joints. It has been shown that taking this form may inhibit autoimmunity against its own type II collagen, which can ultimately minimize inflammation involving the joints. The hydrolyzed type II collagen which is present in the preparation benefits not only the joints, but also the skin. Although this type is not its main component (type I and III predominate in the skin), its supplementation may contribute to the increase in the synthesis of hyaluronic acid and collagen type I. The effect may be to improve the firmness of the skin and smooth the wrinkles. Hyaluronic acid belongs to the group of glucosaminoglycans. It is present in all body tissues and body fluids, however, it is stored in the skin (over 50%), muscles, or the vitreous body of the eye to the greatest extent. In the context of joint health, hyaluronic acid is responsible for the proper viscosity of synovial fluid and minimizes friction between joint surfaces (moisturizes), thanks to which it has a protective function and prevents inflammatory processes and accompanying pain. In addition, it nourishes joint cartilage and gives it adequate flexibility. These properties make the hyaluronic acid effectively protects this structure against abrasions and the load affecting them. It has also been shown that this compound has an analgesic effect and to some extent protects against cartilage degradation (stimulates the synthesis of proteoglycans and chondroitin). In conclusion, Trec Glucosamine Sport Complex is a dietary supplement that comprehensively helps restore the natural conditions of the joints. The product protects, strengthens, regenerates and nourishes joint cartilage and can provide a relief in the case of pain. It is recommended primarily to people whose joints are exposed to heavy loads - runners, competitors of all kinds of strength sports. 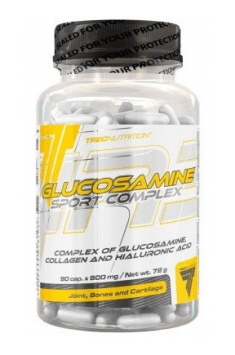 Glucosamine Sport Complex 90 caps. Capsules: Take a single serving of the product - 1 capsule with 300 ml of water. Take 3 servings daily, preferable immadiately after a meal. To strengthen the anti-inflammatory properties, you can additionally include curcumin in the supplementation (necessarily in combination with black pepper, which maximizes its effect). Chondroitin and Boswellia serrata extract may also be helpful. In addition to supplementation, it may be helpful to use physiotherapeutic treatments or seek the advice of a qualified personal trainer, because the pain of joints may be a result of inappropriate exercising. Fillers - microcrystalline cellulose, maltodextrins, modified starch, cross-linked cellulose gum; carriers - dicalcium phosphate, hydroxypropylcellulose, polyvinylpolypyrrolidone; anti-caking agents - magnesium salts of fatty acids, silicon dioxide; color agent - titanium dioxide, FCF brilliant blue, indigo carmine.